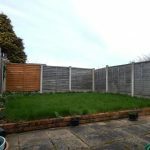 Offered with no onward chain Chariot Estates are pleased to bring to the market this well appointed, modern style three bedroom semi-detached home. 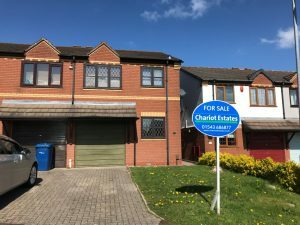 Situated within the Chase Terrace area to Burntwood the property is within easy reach to Burntwood Town Shopping Centre where you can find the local shopping facilities which includes supermarkets, bank, post office, doctors and Burntwood Leisure Centre. 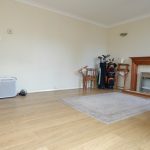 For the commuter the property is within easy reach to the A5, M6 Toll Road and the A38. 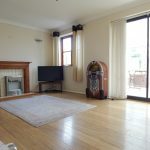 ENTRANCE HALLWAY: Having a useful under stair storage area that opens into the garage, door into the kitchen and lounge, radiator and stairs that lead up to the first floor accommodation. 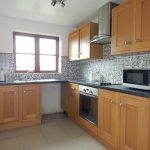 FITTED KITCHEN: 10’8 x 7’2 (3.25m x 2.18m) Having a range of wall mounted and base units, roll top preparation surfaces, stainless steel sink and drainer with a mixer tap over, integrated electric oven and hob with an extractor hood over, space for a fridge/freezer, space for an automatic washing machine, wine rack, splash back tiling, tiled flooring an a double glazed window to fore. 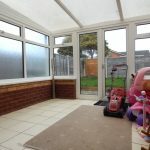 CONSERVATORY: 10’7 x 10’4 (3.22m x 3.15m) Being of a brick built construction having double glazed windows to the sides and rear, tiled flooring and a double glazed door that opens out into the rear garden. GARAGE: 17’3 x 7’6 (5.26m x 2.29m) Having a metal up and over door and a courtesy door into the hallway. BEDROOM ONE: 12’1 x 9’1 (3.68m x 2.76m) Having a double glazed window to fore, radiator and a built in cupboard. 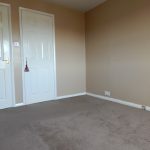 BEDROOM TWO: 10’3 x 8’4 (3.12m x 2.54m) Having a built in wardrobe, radiator and a double glazed window to the rear. 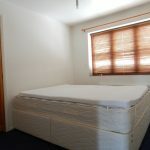 BEDROOM THREE: 11’1 x 5’8 (3.38m x 1.72m) Having a radiator and a double glazed window to the rear. 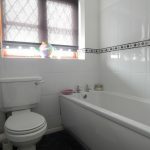 FITTED BATHROOM: Being of a white suite comprising of a panelled bath with an electric shower over, concertina glass shower screen, low level flush W.C, pedestal wash hand radiator, full height wall tiling, extractor fan, radiator and a double glazed window to fore. 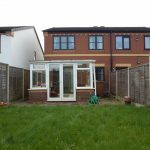 ENCLOSED REAR GARDEN: Having a patio area which leads to an enclosed lawn with gated access to fore. TENURE: Freehold however to be confirmed by a Solicitor.